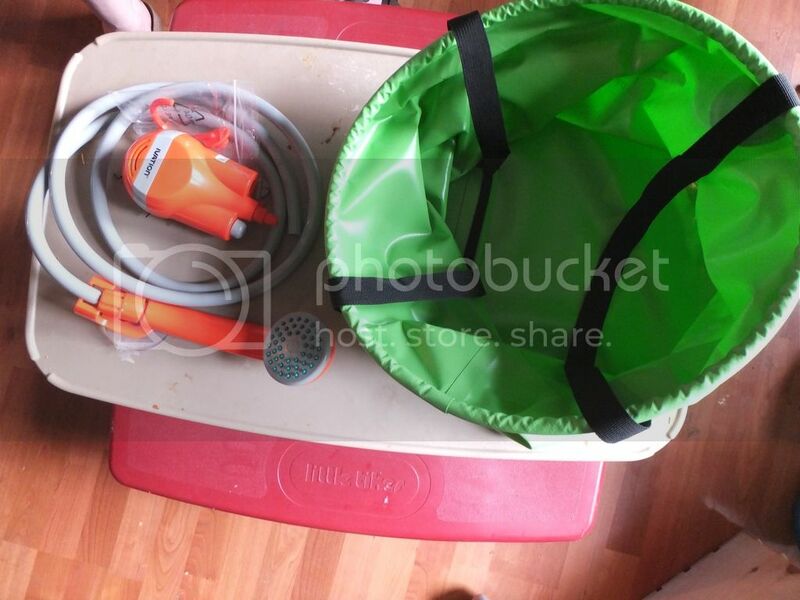 I just tried out our new Ivation shower and our Free Grace 25L collapsable bucket. See below for the Amazon descriptions of both. It gave a nice strong stream of water comparable to the shower in our full size RV. It does not have a water saver switch so I just turned the pump off between soaping and rinsing which was easy. Our Free Grace 25L bucket was 3/4 full and I fabricator and i estimate I used about 2 gallons of water. I didn't wash my hair. The bucket didn't collapse during use and appears durable. I will post updates after we use them on a trip. ✔ The only bucket with LID and comfortable GRAB HANDLE on Amazon! Say good bye to pain hand caused by the heavy water and protect your water from dirt, sand and even prevent fish from escaping! So do you carry a portable EZ up shower house/tent to use that? Dusty, we have been looking at the pop up privacy shelters and have one picked out but Fabricator has a plan to make one out of old tent poles and shower curtains that he can attach to the side of our camper when we need it since it is hard sided. He will have to describe how he plans to do it and I will post pics when he gets in done. This is the pop up privacy shelter I had picked out and would order if my hubby fabricator decides not to make the thing to hang on the side of our camper. This shelter is water proof and has good reviews both for durability and ease of use. I was worried about mold because we will be moving breaking camp most days on our big trip and I don't know if a shelter would have time to dry out. I have one very similar and it works great.. only real downside is the size of the frisbee when it's folded up. That, and learning the trick to folding it. The first time I tried to fold it up I would get to the next to last step and I wasn't doing that 'fold under twist in half' thing and I was getting VERY aggravated! Once I accidentally twigged to that it really is a breeze to setup AND take down. Mine has a 'floor' you can velcro on the bottom. That way you don't have to stand on the grass/mud/pine cones whatever while showering. Never really had a problem wit mildew or anything.. The material sheds water like a duck so it doesn't really stick around. In fact, since we used it as both a shower AND toilet room as soon as showering was done we would take out the bottom, shake it out and put the toilet back in.